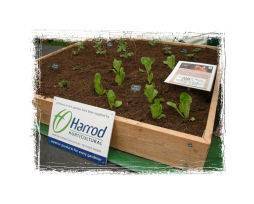 The Royal Horticultura l Society’s (RHS) garden at Harlow Carr recently held the second in a season long series of Kitchen Garden Growing and Sowing events, and Harrod Horticultural were delighted to take part. 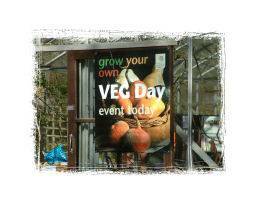 The 27.5 hectare garden on the outskirts of Harrogate in North Yorkshire was the venue for a full programme of informative talks, demonstrations, exhibits and themed family activities, all designed to generate interest in growing your own vegetables. 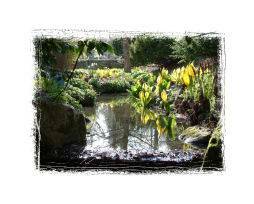 The previous event in February this year proved very popular, and nearly 2,000 paying customers passed through the Harlow Carr gates on April 11th, with 36 visitors taking out RHS membership on the day. 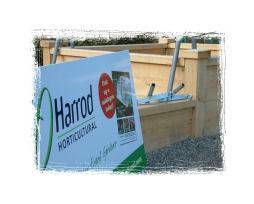 Harrod Horticultural enjoy a close relationship with the RHS and were delighted to demonstrate some of their extremely popular timber raised beds at the event, which, along with the new style of crop protection caravan hoops and ground anchors, attracted much interest. The Lowestoft-based mail order company have their own Kitchen Garden, where products are both developed and tested, and know only too well the pitfalls and benefits of home grown vegetables. Lizzie Balmforth was keen to back up Sarah’s appreciation of the Sneeboer range of tools. “The ladies spade is a real favourite, but I just love my short fat trowel - it’s m y right hand,” she said. And it’s no wonder that Sarah doesn’t need the worry of regularly repairing or replacing tools, as she is heavily involved with the RHS-funded Gardener’s Question Time Garden project. This ambitious scheme will see the programme broadcast from Harlow Carr’s own custom built garden, currently in the first stages of design with input from both TV favourite Chris Beardshaw and multi-Chelsea gold medal winning designer Bunny Guinness. Harlow Carr are hosting two further Kitchen Garden Sowing and Growing Events later this year; on August 31st the theme is harvesting, whilst a week long special which coincides with the October half-term (20th to 28th) concentrates on ‘A Taste of Autumn’. For full details of these and the many other courses and workshops held at the garden, contact RHS Harlow Carr on 01423 565418 or visit the comprehensive website here.